Organisation is not something that comes naturally to me. I look at Pinterest accounts of people with perfect bullet journals, schedules they stick to and houses so clean they gleam, and then shrink back into my own life and wipe away the crumbs and stare at unfolded laundry. Every year I resolve that this year is to be the year of organisation. I download the apps. The lists get written. I even manage to keep a handle on the laundry for oh, about a week. 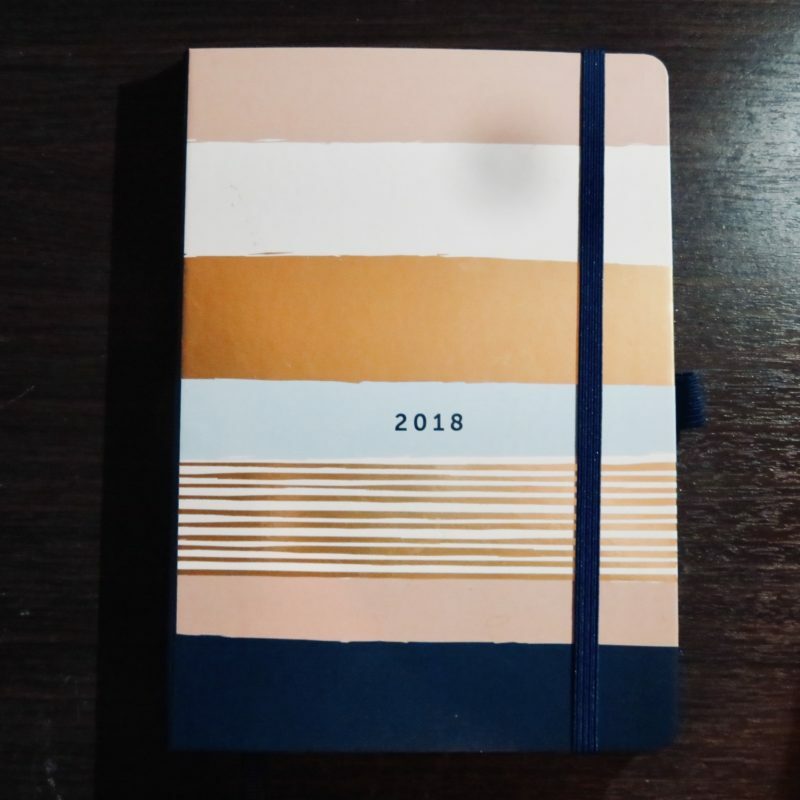 I do find writing things down tends to help with this, so I was thrilled to receive a Busy B Busy Life Diary in the post last week to help me get on top of my resolution. 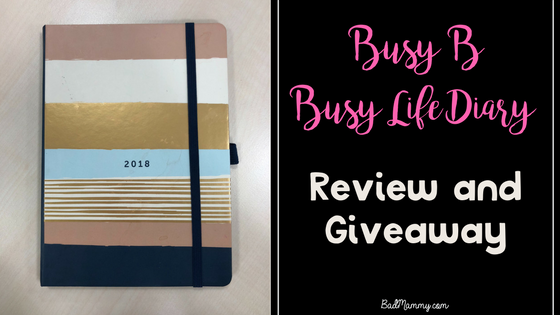 The Busy B Busy Life Diary 2018 comes in two styles. The one I’ve been using is the Contemporary Style. The other option is the “Pretty” style and is a gorgeous lilac affair. They always manage to get the colours just right. The Busy B Busy Life Diary helps me to lay out my life, a week at a time, but for much more than others do. For one, it gives me two sections for each week; one I designate as my personal diary, the other is for blog and freelance related stuff. We’ve got a busy couple of weeks ahead, as the purchase of our house is at the very finishing stages, so it’ll definitely be looking a whole lot more worn out as the weeks go on. It’s living in my handbag and the handy pen holder means that I’ve got one stashed with me at all times. It’s not yet become home to piles of paper – hopefully this will continue. At A5 it’s a decent size to actually fit everything into, but not so big to be awkward to carry. When you’re a busy mum, space is at a premium, and anything too bulky or heavy gets the toss out of my bag. As well as the two page spread for each week, every three months there is a useful pocket for storing bits and bobs. Handy for stashing notes and receipts until I find the proper place to put them. Because I’m definitely working on that this year. Ahem. 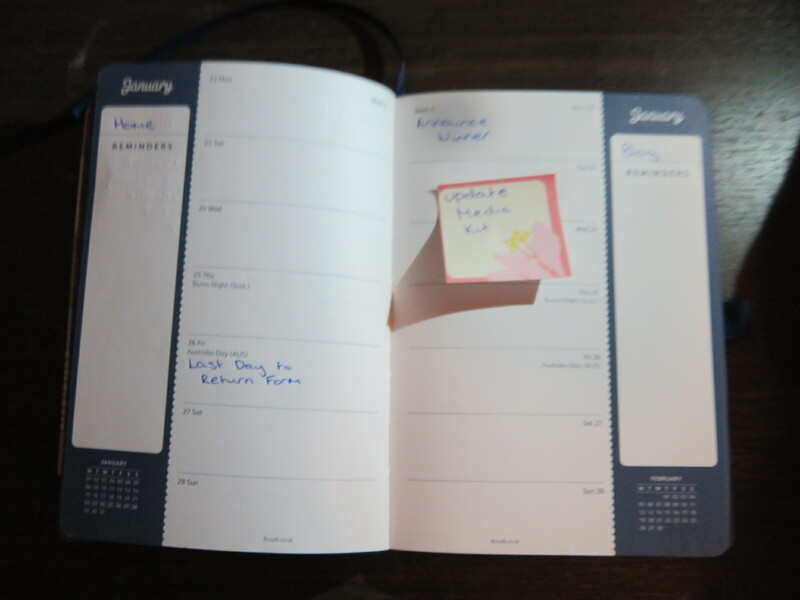 Like the 2017 diary, as well as the double-page-per-week layout, it’s also got a great grid layout for each month for longer-term planning which is great for things like working out work shifts, holidays etc. 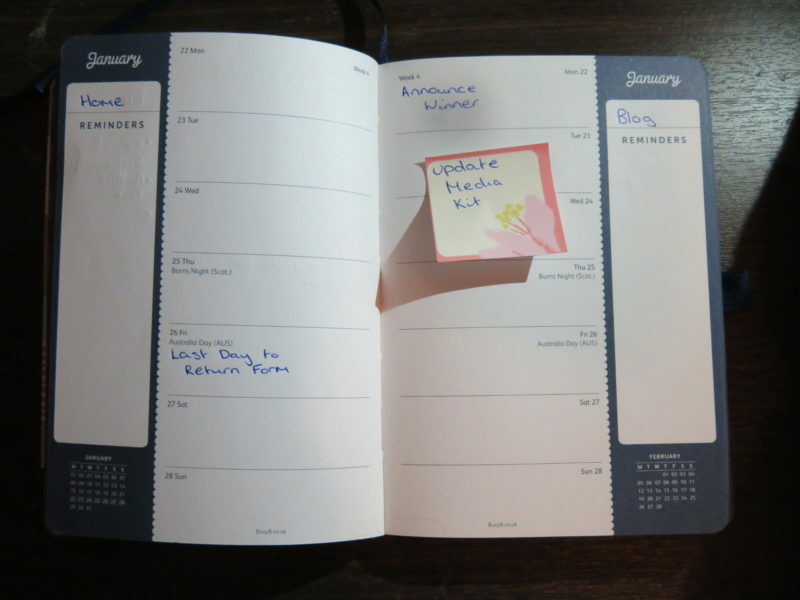 The Busy B Busy Life Diary retails for £10.99 on the Busy B Website. If you’re looking for it elsewhere they’re on Amazon for £10.43 and numerous other bookshops. I’m already eyeing up a few other products on their website, especially the sticky notes and perhaps some other notebook bits and pieces. 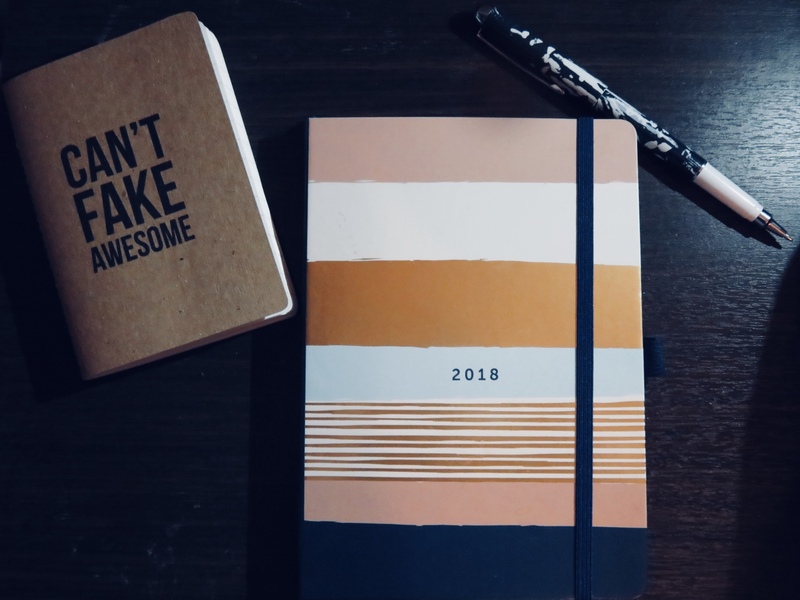 I think it’d make a fantastic gift, and an even better start to your own New Year if like me you’re vowing to get more organised but have yet to make it happen two weeks into the New Year. If you’re in the UK, purchases above £15 have free delivery. This isn’t the case outside of the UK, so I’d be inclined to get them sent to something like Parcel Motel or Parcel Wizard to save your savings instead. LIKE: Busy B on Facebook. Comment below or on This Facebook Post with the thing you want to see in your life this year, 2018 – big or small, what are you anticipating and looking forward to? The competition is open until Sunday 21st January at 9pm, and winner will be announced on Monday 22nd at 9am. Competition is open to Ireland and UK residents only. If you’re looking to purchase a Busy B Busy Life Diary on the Busy B website, you can get 15% off your first purchase from their website. Enter code BB15 in the discount code box within your basket to receive 15% off your basket (excluding delivery). This is valid on first orders only and can only be used once per customer. Must be logged in when placing order. Valid online only. Cannot be used in conjunction with any other offers INCLUDING OFFER BUNDLES AND ANY SALE CATEGORIES OR SPECIAL PRICE ITEMS. BadMammy is also over on Instagram, come over and say hello! Would love this! Gorgeous colours and could so do with being more organised this year! !